President John F. Kennedy visits Naval Station Key West in Nov. 1962 — the last time a sitting U.S. president came to the island. Menu for the dinner in honor of Ulysses S. Grant, in 1880. Former President Ulysses S. Grant stopped in Key West for a day in 1880. William Howard Taft, center, shakes the hand of Key West's mayor after riding the Overseas Railway to Key West in 1912. He was on his way to Panama, to inspect the work on the canal. Calvin Coolidge was on his way back from a meeting in Cuba in 1928 when he stopped in Key West, then rode a train to the mainland. Franklin D. Roosevelt visited the Keys six times, starting in 1917. His final visit was in 1939, when he rode an open convertible down the new Overseas Highway. 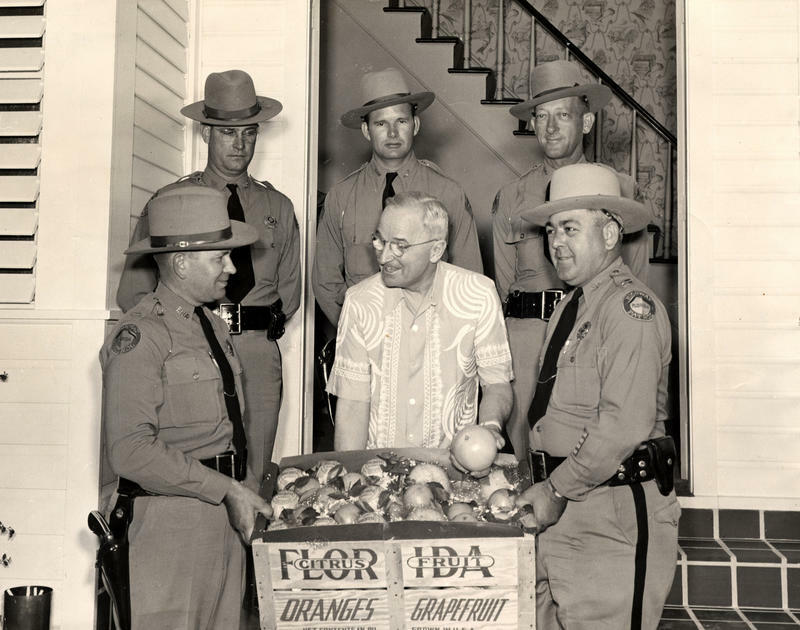 Harry Truman visited Key West 11 times during his presidency. This photo is from March, 1949. John F. Kennedy and British Prime Minister Harold Macmillan met in Key West for a one-day summit in 1961. But the island's location and climate give it a long history of visits from the nation's top executive. 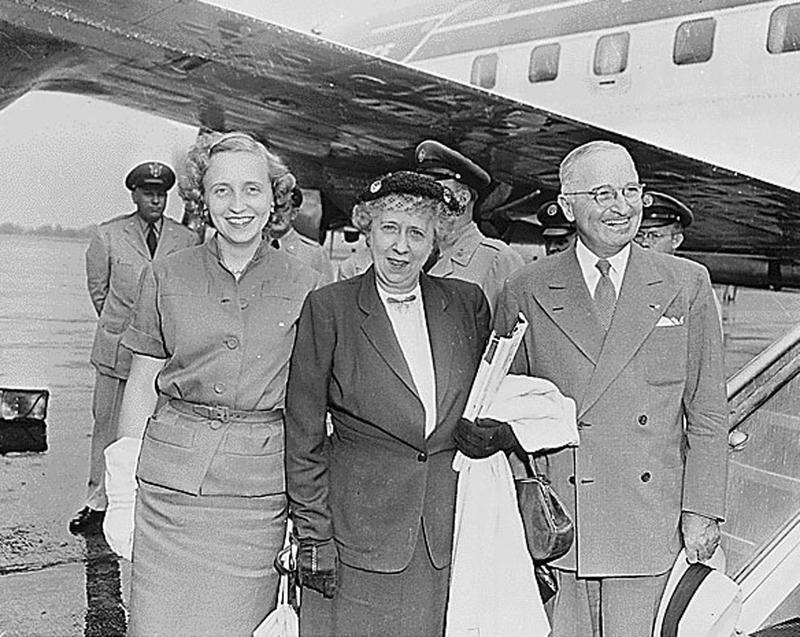 One of its most famous visitors was Harry Truman, who came to Key West 11 times during his presidency. He stayed at a Navy's officer's residence — it's now a museum known as the Harry S. Truman Little White House, located in the Truman Annex. The first U.S. president to visit Key West was Ulysses S. Grant. He came in 1880, 11 years after leaving office, while traveling with another Civil War general, Phil H. Sheridan. They were on a steamship from New Orleans, bound for Havana, but stopped and spent the day in Key West — then one of Florida's largest and most prosperous cities. "It was a day memorable in the general history of the island — all stores were closed and it was made a general holiday," wrote Jefferson B. Browne in his 1913 account Key West: The Old and the New. Locals provided a dinner for their distinguished guests, with menus printed on silk in the colors of the American flag. The Monroe County Public Library's has a copy of that menu — which features delicacies such as "Boca Chica Terrapin, Devil'd" and "Pickled Beef Tongue." Another Civil War leader had already been to the island and was also fêted by locals. Jefferson Davis, the president of the defeated Confederacy, stopped on the island in 1867 after he was released from prison on bail. "Mr. Davis' long confinement in Fortress Monroe [in Virginia] had broken his health, and he was advised to go to Cuba for the winter," Browne wrote. While Florida was part of the Confederacy, Key West stayed in Union hands throughout the war and the forts there and in the Tortugas were important bases for the blockade of Confederate shipping. 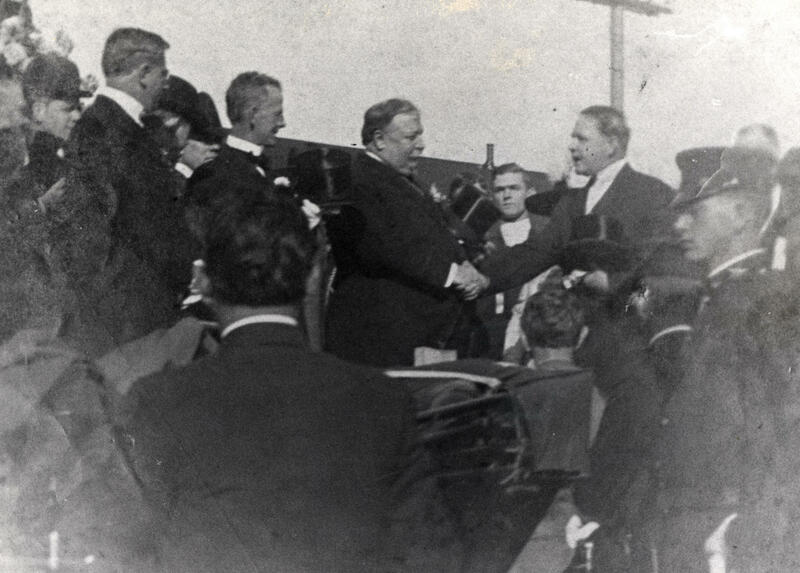 President William Howard Taft, center, shakes the hand of Key West's mayor after riding the Overseas Railway to Key West in 1912. He was on his way to Panama to inspect the work on the canal. 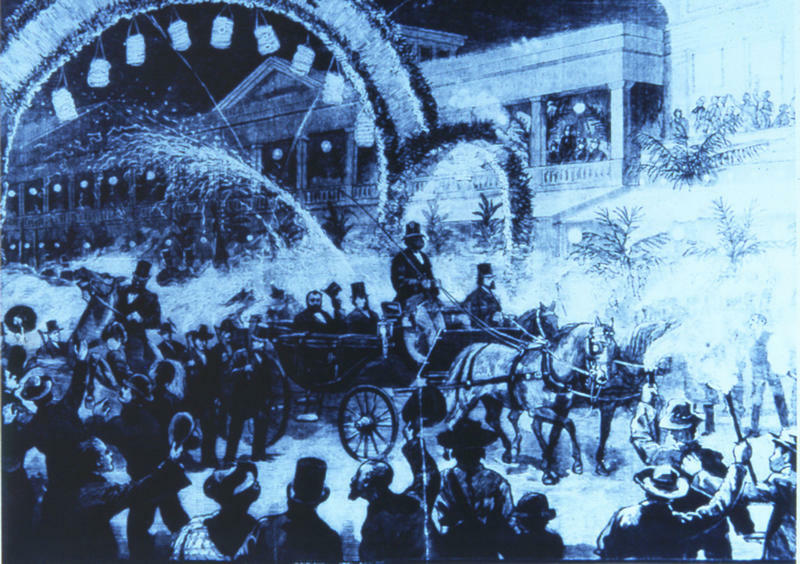 In 1889, after his first term, Grover Cleveland also stopped in Key West. He was traveling with the former secretary of state and the governor of Virginia. "They spent only a few hours in the city, but during that time they were shown around the island in carriages, and held a public reception in the Russell House," Browne wrote. William Howard Taft rode the Overseas Railway to Key West in 1912, 11 months after it opened. He was on his way to inspect the Panama Canal and embarked on a ship from Key West. 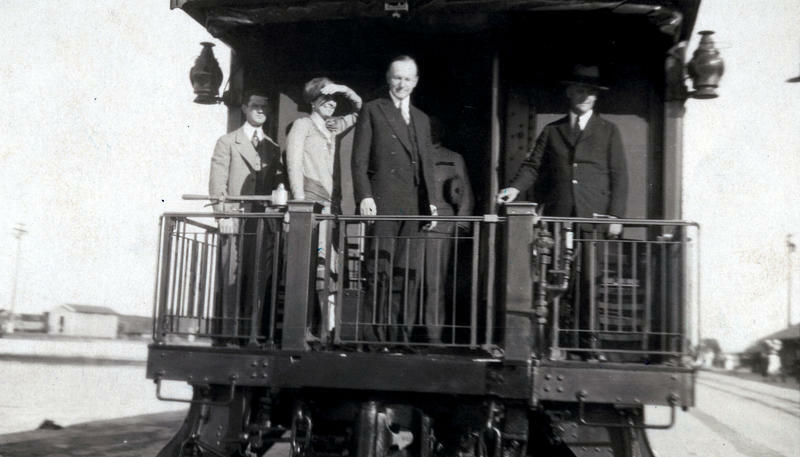 And Calvin Coolidge stopped in Key West on his way back from a meeting in Cuba in 1928, riding the railroad back to the mainland, according to Presidents in Paradise by Truman Little White House executive director Bob Wolz. 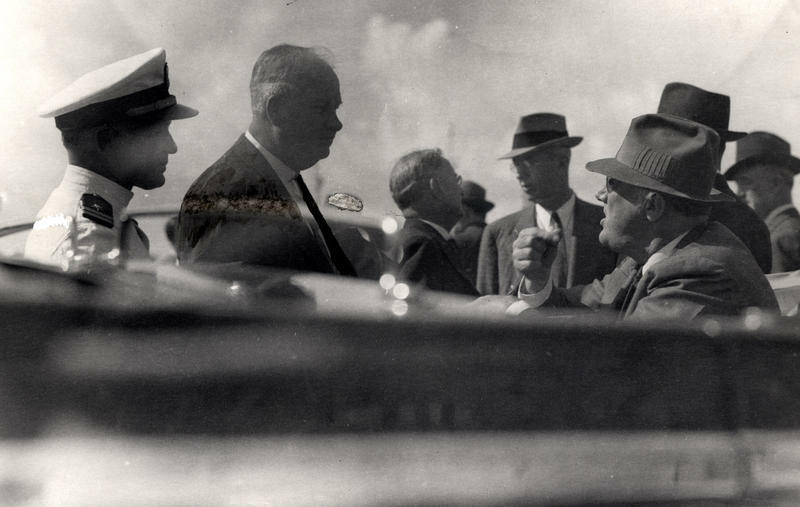 Franklin Delano Roosevelt visited the Keys six times between 1917 and 1939. His first stop was when he was a young assistant secretary of the Navy, en route to Cuba and Haiti, Wolz writes. Roosevelt wintered in the Keys on his houseboat for four years in the 1920s, after he was stricken with polio. After his houseboat sank in a hurricane, he started spending time in Warm Springs, Ga., instead. But he returned to the Keys as president in 1939, riding in an open-air convertible down the newly constructed Overseas Highway. "The city's gratitude for the aid they had received through the Federal Emergency Relief Administration, Works Progress Administration and Public Works Administration was expressed by the most enthusiastic parade the community had ever seen," according to a 1947 Miami Daily News story quoted in Wolz's book. "Key Westers named for him the beautiful boulevard which dramatically rims most of the island waterfront." It's not the only street in Key West named for a president. There's also Truman Avenue and Eisenhower and Kennedy drives. Dwight D. Eisenhower first came to Key West before his presidency — when he was the presiding officer of the Joint Chiefs of Staff. According to Wolz's book, Ike spent 21 days at the Little White House while recovering from illness, at Truman's recommendation. He returned in 1955, when he was recovering from a heart attack. With an active Navy base and warm weather, Key West was an attractive place to recuperate for the nation's top executives. Secretary of State John Foster Dulles spent several weeks on the island in November 1956 while recovering from stomach cancer. While here, he received a visit from the vice president — future President Richard Nixon. 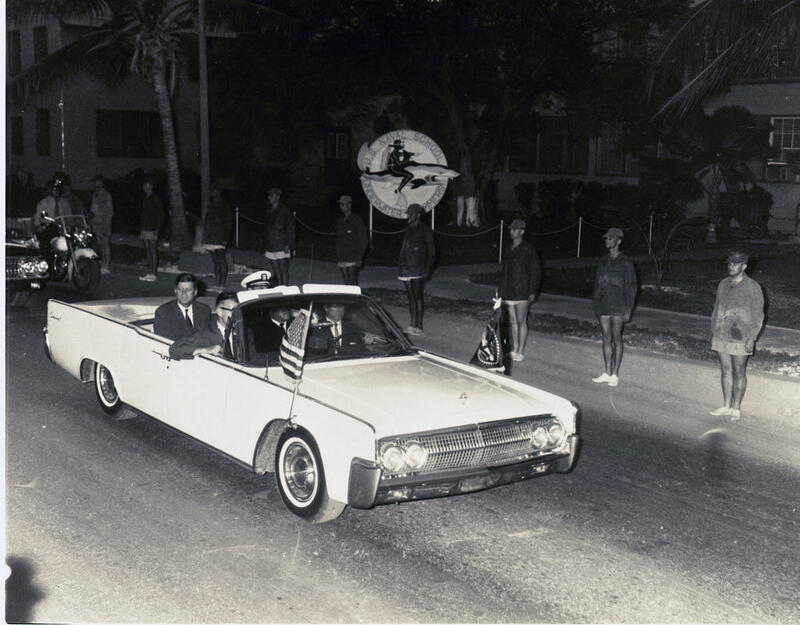 Kennedy's first trip to Key West came in March of 1961. He was spending time at his family home in Palm Beach while British Prime Minister Harold Macmillan was in Trinidad. The two met in Key West for a one-day summit. 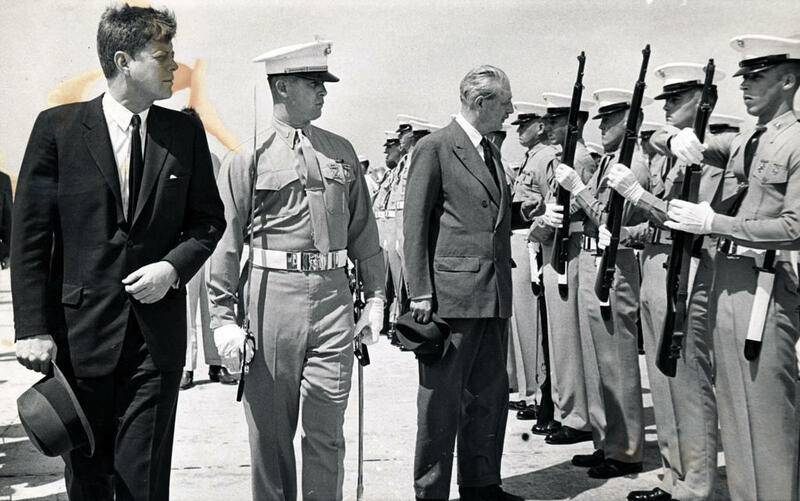 Kennedy returned in November 1962, to award military decorations and inspect U.S. defensive arrays after the Cuban Missile Crisis a month earlier. Other presidents have visited Key West since 1962, including Jimmy Carter and Bill Clinton, but both after leaving office. President George H.W. Bush famously liked to fish in the Keys — but he spent time in Islamorada, in the Upper Keys. A few weeks ago, while mowing the lawn, Clifton Daniel began to recite a monologue in character as Harry S. Truman. As Washington, D.C., gears up for the 57th presidential inauguration, political parties are in full swing. We're not talking about run-of-the-mill partisan bickering. We're talking about inaugural celebrations: balls, galas and cocktail parties. Emphasis on the cocktail. The Round Robin Bar in the Willard Hotel is just a stone's throw from the White House. 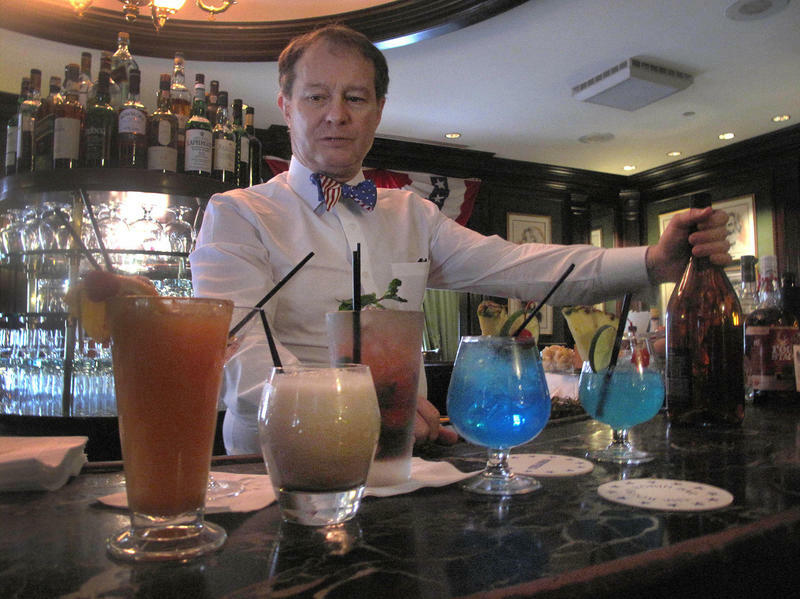 Bartender Jim Hewes has been serving up drinks there for nearly 30 years.